I’m sure some of you noticed that there wasn’t a roundup last week (*cough* my fault, hence the joking post title *cough*), as I got sorta caught up actually building out various parts of the site, in addition to a variety of crises throughout the week. After an amusing week of fixing features I didn’t think were broken in the first place, I think things on the site should be settling down now. To start things off, I’m changing the format of the weekly roundup. Actually, there isn’t going to be a weekly roundup anymore — now that I’ve recamped the homepage to show the latest blog posts, I’m hoping more people will see/read them, so I’m just going to post stuff as I see fit. I’ll still post a note about the Editor’s Picks every Monday, though, which is what I’ll do now. The other big news on the site this week was that we hit a major milestone: Protagonize cracked the 1,000 registered authors plateau last Sunday! We’re actually sitting at about 1,100 authors now, which is awesome. I’m hoping the site will spread virally and that you guys will help me bring in new writers (and readers!) to the site as I keep building out new features and functionality. You may also have noticed the new notifications feature is now live on the site. I’ll posting something here discussing how this works in the next day or two. “Fire exploded out of Kai’s hands, scattering everyone watching the lesson. Master Tharyn side stepped just far enough that the flames shot past him but left his cloak smoking from the heat. Last week’s Editor’s Pick was “Land Before Time“, an addventure by veteran Protagonist redhat. The story still ranks second in our Hot Stories this week, so check it out! 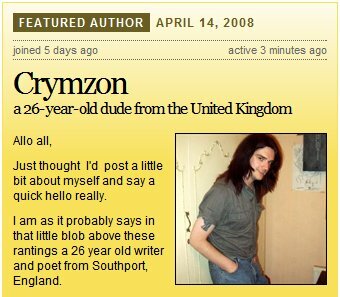 This week’s featured author is Crymzon, a 26-year-old dude joining us from the U.K. Crymzon‘s most popular story on Protagonize thus far is “Questworld“, which has been sitting tight in our top five Hot Stories since he shortly after he joined, a scant 5 days ago.Crymzon has posted two stories and eight branches or chapters since joining the site, in addition to posting 14 comments, and he has a 4.00 average rating based on 19 ratings from other Protagonists. Congrats! Last week’s Featured Author was jait, another Canadian who’s picking up a major following of favourites and is making his presence felt around the site. As a quick aside, Protagonize was in the press again in the last week and a bit.As I mentioned in a previous post, Andre Charland of local Vancouver development firm Nitobi posted both a screencast and podcast that we did a few weeks back on InsideRIA.com, a joint venture from O’Reilly and Adobe covering new trends and developments in rich internet applications. Thanks, Andre! Also, Emily Chang featured Protagonize on her site, eHub, which profiles web applications, services and sites, with a focus on next generation web and social sofware. As I noted above, this roundup is going to be short and sweet. From this point onwards, aside from the Editor’s Picks every Monday, I’ll be splitting up posts as necessary on the blog. I think that’ll make for a little more light-weight reading, and headlines should be a bit more noticeable on the site’s homepage. If you have any feedback or suggestions, as usual, please comment here and let me know! This entry was posted in Features, General, Press, Site updates, weekly roundup and tagged "editor's pick", ehub, Features, insideria, notifications, protagonize, roundup. Bookmark the permalink.